This was the fifth match of the Australian SFA tour of the UK and Ireland and the English Schools’ FA were pleased to welcome their visitors to a new ground with an excellent playing surface prepared by the Shrewsbury Town groundstaff. The game started brightly for England and they enjoyed the majority of the possession. Matthew Bloor (Humberside) set the early tone with a thundering shot which the Australian keeper, David Lowery, did well to parry away. England, playing with great authority in midfield, continued to cause trouble for the visitors and they took the lead following a corner in the 10th minute. A short corner was followed by an accurate delivery to the far post where Aaron Martin (Hampshire) headed down for Tom Siddons (Lincolnshire) to fire home from close range. England increased their lead in the 36th minute when Tom Grice (Merseyside) tapped home following a free kick delivered into a packed penalty. Aaron Martin once again provided the ‘assist’. The second half, fuelled by numerous early substitutions, remained competitive but provided no further goals although the Australian keeper was required to perform heroics on a number of occasions and the visitors went very close with the England bar being struck in the dying minutes. Jack Thorley (Staffordshire) was presented with the Premier Travel Inns ‘Man of the Match’ award following the game. 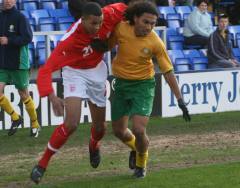 This was a good start to the English Schools’ FA International Season with the team showing great promise. Ben Lewis, Ashley Ulph, Alex Duffy, Christopher Smalling, Aaron Martin, Jack Thorley, Matthew Bloor (Capt), Harry Hambleton, Tom Siddons, Lucas Pickett, Tom Grice.